I've had a couple of weeks to play around with these Stargazer products and thought it was time to give you the skinny on the brand. I first came acros Stargazer products while perusing the rails in New Look but I didn't really pay much attention to it. The brand is home to some seriously bright and luminous coloured makeup which, I guess, distracted me from the other products and colours it has to offer. Anyway, when I was contacted by the PR people and asked if I'd like to give the products a go I was a teeny bit hesitant. My mind immediatly wandered back to those luminous shades that I had seen previously and thought I'd probably be better off without. Well, I was assured by the PR exec that she would send me some more subdued and wearable colours that wouldn't make me look like I was tripping off a crazy rave that involved glow sticks. 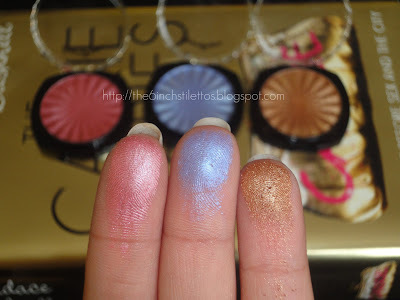 I was a sent a selection of eyeshadows, loose pigments and nailpolishes all in very wearable colours so here's the low down! The blue eyeshadow swatches a little less pigmented than I would have expected but then I guess that's a good thing because a heavy layer of blue eyeshadow can't be a good look on anyone. Well, anyone except Pat Butcher. I'm not a big fan of loose pigments/dazzle dusts/eye dusts or anything of the sort. I just find them far too fiddly for my liking and 9 times out of 10, I get them everywhere. I've tried working with them before but I personally don't think they're worth the hassle. 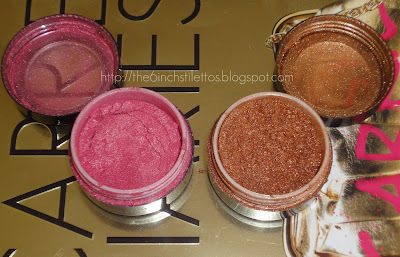 However, for the sake of this review I had to put my own opinions aside and dig into the little pots to get you the swatches... The things I do for you lot! These little pots are quite pigmented and considering the amount of shimmer there wasn't a ton of fallout but I did have to blow off the excess before I took the photo. For some reason the gold dust is not as finely milled as the pink but it didn't really make a huge difference to be honest. They do the job and for those who like loose pigments, these are probably well worth their price tag. I havent' used or swatched the nailpolishes since I've had them because I'm trying to make my way through the older ones that I bought recently and haven't used. However, I do like the look of these beauties and I'm hoping that they aren't streaky or lumpy. 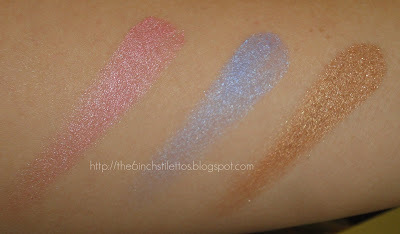 The pink shades are glosses and the blue shades are chromes. I'm liking the look of the dark blue shade and I'm really hoping that it has a creamy consistency and not going to need a million coats... OK, I'm exaggerating. You know what I mean though. The eyeshadows are probably my favourite products because I was so impressed with the colour payoff. They weren't too shimmery or metallic but had the just right touch of pearl to make them wearable and still bright... If that makes any sense! 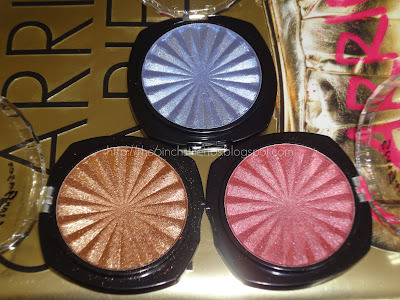 Like I said, eye dusts aren't my thing but I plan on trying them out in an EOTD sometime soon so I can give you a complete run down on their use. All products are available from Stargazer concessions and from their website which is HERE. SMALL PRINT: All products were sent to me for review purposes only. I'm not being paid nor am I affiliated with the company. Any opinions expressed are my own. oh my, how gorgeous is blue lagoon! 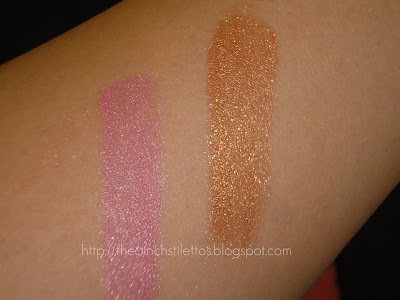 Im a big fan of Stargazer but I agree, when I am in New Look the luminous colours just stand out and make me shudder. I have seen some great colours on the website though and had sneak peaks through twitter. Kellie, those luminous shades are eye watering and not in the good way!! 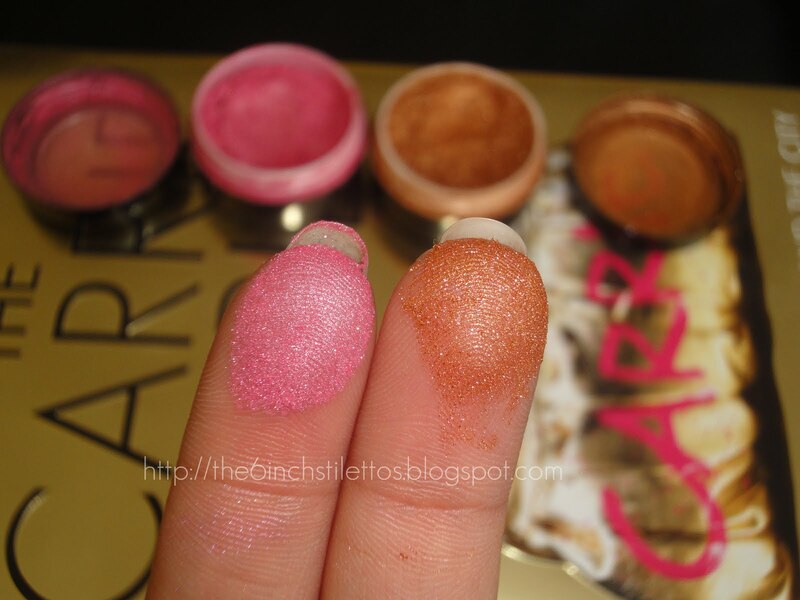 It's the reason why I've always avoided the stand but maybe after trying out these products.. I'll have to take a closer look next time.